After the cut scene, you’ll find yourself entering a dual with Voldemort, use your duelling skills to win the duel. Watch out for Voldemort and head to the bottom of the screen where you’ll see a statue. Press and hold the A button and directional buttons to move the statue into place. Make your way to the right hand side of the area where you’ll find another statue, this time use the ‘Reducto’ spell on the statue to destroy it, leaving a shield. Press the A button to collect the shield and place it on the other statue. Use the ‘WL’ spell on the statue to turn it around; Voldemort will shoot at the shield and obstructions will appear in the area. (Wizards Hat) – (Free Play Mode) Switch your character to either Ron or Dumbledore and use the ‘Deluminator’ ability on the lit lamp in the top left hand corner. Head to the bottom right hand corner and you’ll see an unlit lamp, use the ‘Deluminator ability to light the lamp. This will cause the tapestry to burn away revealing a silver wall, use the ‘Reducto’ spell on the wall and then use the ‘WL’ spell on the ‘Weasley Wizard Wheeze Box (WWWB)’ to place it on the floor. Finally switch to Weasley character if your not already playing as Ron and press the A button to reveal a Wizards Hat. (Lily Potter Character) – (Free Play Mode) Switch a character with the ‘Pet’ ability (e.g. Hermione) and use the ‘Pet’ ability to get the Hermione Bag Spot to the top left of the area down to the ground. Switch your character to Hermione (if it’s not already) and use the Bag Spot to gain the Lily Potter Character token. (Wizards Hat) – Use the ‘Lumos’ spell on the devils snare covering the wizards hat to gain the Wizards Hat. Use the ‘Lumos’ spell on the devils snare covering the grates to release them and then use the ‘WL’ spell to put it in place. Jump on the grate and use the ‘Lumos’ spell on the devil’s snare to the left to release a fiery stick. Use the ‘WL’ spell on the stick of fire to get the devils snare above and move Voldemort. You will find yourself being taken up to the roof where you will enter another duel with Voldemort; win the duel to continue. In this area you’ll now play either Ron or Hermione, I recommend starting with Hermione. Head to the left and use the ‘Pet’ ability to dig up a cauldron from the ground and use the ‘WL’ spell to launch the cauldron at the Troll in the top left corner (the DS is a bit glitchy while doing this, when Hermione begins to move just keep your finger on the A button and directional buttons and it will hit the Trolls head). Use the ‘WL’ spell on the trident that the Troll drops to hit the Troll (the same glitch as mentioned above may happen here too). (Bellatrix Lestrange Character) – Use the ‘WL’ spell on the cauldron to gain the Bellatrix Lestrange Character token. Now switch your character to Ron and head to the right hand side of the area (be careful of the snake guarding the gateway) and use the ‘Deluminator’ ability to get the light from the lamp. Head to the far top left corner and light the lamp with the ‘Deluminator’ ability. Do the same for the other lit lamp found at the bottom left side of the area; this will release a statue to slay the snake, the statue gets eaten up and spat out. Use the ‘WL’ spell on the pieces the snake spat out to create a Hermione Bag Spot. Switch your character to Hermione and use the bag spot to gain a pair of scissors. Use the ‘WL’ spell on the scissors to cut the rope holding up the gate which will fall down on the snake and make it move on. (Molly Weasley Character) – (Free Play Mode) Switch your character to Luna Lovegood and use the ‘Spectraspecs’ ability to make the semi-transparent green rock visible. Use the ‘Reducto’ spell on the green rock to gain the Molly Weasley Character token. Use the ‘WL’ spell on the gate to raise it and exit. At the back of the area you’ll see a character and a death eater duelling, to break up the duel use the ‘Reducto’ spell on the lamp shade hanging above the death eater; the character will clear the way for you to continue. Switch your character to Luna Lovegood and use the ‘Spectraspecs’ ability to allow you to interact with the Lego pieces at the bottom of the screen. Use the ‘WL’ spell on the pieces to create a cannon to defeat the death eater. Continue through to the next section where you will enter a duel with Bellatrix Lestrange, win the duel to defeat her and continue. You’ll now find yourself back in the courtyard as Ron. (Voldemort Character) – (Free Play Mode) Switch to a ‘Dark Magic’ character (e.g. Tom Riddle) and use ‘Dark Magic’ on the statue to the bottom centre of the area to gain the Voldemort Character token. Switch your character to Hermione, head to the left hand side and use the ‘Pet’ ability to bring the bag spot down to the ground. Use the bag spot to get a road drill and use the ‘WL’ spell on the drill to drop some roof tiles onto the snake. Switch your character back to Ron and head to the top left corner where to snake was and use the ‘Deluminator’ ability to gain the light from the lamp. Head to the far left of the area (go to the south to get past the snake) and light the unlit lamp behind the snake. Once the tapestry has burnt away, use the ‘Reducto’ spell on the silver wall behind the tapestry to reveal a ‘WWWB’. Use the ‘WL’ spell on the ‘WWWB’ to bring it away from the wall and press the A button to open it. Use the ‘WL’ spell on the Lego pieces to create a ball and use the ‘WL’ to get the ‘Decoy Detonators’ to hit the snake. (James Potter Character) – Behind the snake in the courtyard doorway you’ll see a pile of wood set back in the door way. Use ‘WL’ spell on the wood from a safe distance to trap the snake in a clamp and gain the James Potter Character token. Now you need to hit the snake three times to defeat it. Head to the left of the snake, you’ll see the sorting hat on a touch, use the ‘WL’ spell along with the down directional button to get the sorting hat down. Then use the ‘WL’ spell on the hat to reveal the Griffindor Sword. Collect the sword and press Y next to the snake to hit the snake, you need to do this three times to defeat to snake. You’ll now enter into another duel with Voldemort, win the duel to continue. (Chain Targets Red Brick) – (Free Play Mode) Switch your character to Dumbledore or Ron and use the ‘Deluminator’ spell on the left hand side lit lamp to the top right of the area. Use the ‘Deluminator’ spell on the unlit lamp in the top left corner of the area to gain the Chain Targets Red Brick. (Wizards Hat) – Head to the top left of the area and pick up the bunch of flower, head over to the cauldron to the right and place the flowers in the cauldron. Head back to the where you found the flowers and you’ll see a spider in the corner of the wall. Shoot the web and collect the spider, then put the spider in the cauldron. Use the ‘Reducto’ spell on the icicle above the cauldron to get an ice lolly and put it in the cauldron. The cauldron will explored bringing down the right hand side lit lamp. Use the ‘WL’ spell on the fallen lamp to move it to the right of the devils snare holding the Wizards Hat then you need to get the light from the other lamp and use the ‘Deluminator’ spell on the lamp to increase the brightness of the light and gain the Wizards Hat (in other words both sets of light need to put on this one light). Shoot Voldemort to deplete some of his health and enter another duel, win the duel defeat Voldemort. This entry was posted in DS and 3DS, Games, Lego Harry Potter Years 5-7 on June 11, 2012 by Tasha. Next to the statue at the top left of the screen, you’ll see an arch covered with devils snare. Use the ‘Lumos’ spell on the devils snare to reveal a watering can. Use the ‘Arguamenti’ spell on the watering can and then use the ‘WL’ spell to pour the water over the fire. (Seamus Finnigan Character) – To the bottom right and top left of the screen you’ll see a statue, use the ‘Reducto’ spell on the statues. Head through the door way and switch your character to Ron (or another weasley character in free play mode). Press the A button to use the ‘Weasley Wizard Wheeze Box (WWWB)’ to gain a pair of sucker pads. Use the sucker pads to make your way up the Weasley walkway. At the top of the walkway you’ll see the third statue, use the ‘Reducto’ spell on the statue to reveal the Seamus Finnigan Character token. (Wizards Hat) Before continuing, use the ‘Arguamenti’ spell on the three small fires around the area (1 at the top of the walkway and the other two on the ground) to gain a Wizards Hat. Make your way back up the walkway again and use the ‘WL’ spell on the two cogs lying on the floor to raise the gate and release the troll. Exit to next area via the blue platform. Make your way along the path, shooting the death eater and crates. You’ll enter an area with the troll, make your way around the area and put out the fires to make it easier to move around. (Unlock Three Characters) – Head towards the troll and then to the far right and you’ll see a silver rock in the foundations, shoot it and you’ll unlock three Characters. (Gregory Goyle Character) – (Free Play Mode) Switch to a ‘Dark Magic’ character and use ‘Dark Magic’ on the red and black wall under the Troll to gain the Gregory Goyle Character token. Head back through the opening to the bottom of the area and switch your character to Hermione and use the Hermione Bag Spot to reveal some Lego pieces. Use the ‘WL’ spell on the pieces to build a golf club and then use the ‘WL’ spell on the golf club to hit the troll with the golf ball. Head to the top of the area and you’ll see some bricks have appeared, use the ‘WL’ spell on the bricks to make a set of stairs and head up the stairs. (Wizards Hat) – Stand in the yellow ring and press and hold the A button to transport your character to another room where you’ll gain a Wizards Hat. Head back through the yellow ring and shoot the death eater at the other end of the platform and continue through the doorway and continue via the blue platform to the Hogwarts Gatehouse. Make your way through the area until you see the troll guarding the Hogwarts Gatehouse. (Wizards Hat) – (Free Play Mode) Switch to Luna Lovegood and use the ‘Spectraspecs’ ability to make a pile of Lego bricks visible. Use the ‘WL’ spell to create a Hermione Bag Spot and switch your character to Hermione. Use the Bag Spot to find a watering can and use the ‘Arguamenti’ spell on the watering can to fill it up. Use the ‘WL’ spell on the watering can to put out the fire and gain the Wizards Hat. Switch your character to Harry Potter and use the ‘Invisibility Cloak’ ability to sneak past the Troll. Head to the right hand side of the Troll and move the cloak. Use the ‘Diffindo’ spell on the red wall and then use the ‘WL’ spell on the red Lego pieces to create a musical box and move the Troll. 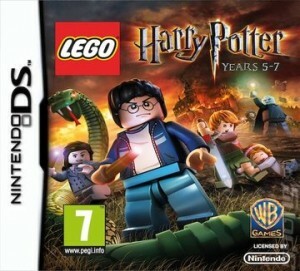 (Mr Ollivander Character) – (Free Play Mode) Head to the left hand side of the Boathouse doorway and switch your character to either Fred or George Weasley and use the ‘Decoy Detector’ ability (press the Y button to detonate) to destroy the black and orange box and gain the Mr Ollivander Character token. Exit via the blue platform to the Boathouse. (Professor Vector Character) – (Free Play Mode) Head the left and you’ll see a wardrobe with a red and black padlock. Switch to a ‘Dark Magic’ character (e.g. Professor Umbridge) and use ‘Dark Magic’ to break off the padlock. Use the ‘WL’ spell on the little boat to place it in the water. Head to the far right of the room and use the Hermione Bag Spot to gain another little boat. Use the ‘WL’ spell on the boat to put it in the water. The boats will circle the water revealing the Professor Vector Character token in the water. Use the ‘WL’ spell on the boat to the top left of the area to reveal a Hermione Bookcase. Switch your character to Hermione to use the bookcase and gain a cog. Head to the far right and place the cog on the machine indicated by the white arrow. Pull the lever to the right to lower a boat. (Wizards Hat) – Head round to the right and use the ‘Arguamenti’ spell on the water canister to gain a Wizards Hat. (Tom Riddle Character) – Stand to the north of the room by the water and you’ll see a silver platform in the water, use the ‘Reducto’ spell on the platform to let you gain access to the Tom Riddle Character token in the water. (Funny Jump Red Brick) – (Free Play Mode) Switch to Luna Lovegood and use the ‘Spectraspecs’ ability on the semi-transparent Yellow transformation ring to the bottom right of the room. Use the Yellow transformation ring to transport to a secret room. Switch your character to a character with the ‘Key’ ability (e.g. Bogrod) and use the ‘Key’ ability to open the green safe and gain the Funny Jump Red Brick. Head back through the Yellow transportation ring. Head to the bottom left of the room and use the ‘Lumos’ spell on the devils snare holding the anchor. Then use the ‘WL’ spell on the anchor to attached it to the pulley and raise the boat in the water. While on the left hand side of the room, switch your character to Ron and use the ‘Deluminator’ ability to gain the light from the lamp and head to the far right hand side of the room. You’ll see another lamp, use the ‘Deluminator’ ability to light this lamp and lower the last boat. Collect the item from the boat and give it to Professor Snape. Now exit via the blue platform. This entry was posted in DS and 3DS, Games, Lego Harry Potter Years 5-7 on June 10, 2012 by Tasha.